Making Sense of Maths is the only series that develops conceptual understanding of students at key stage 3 and key stage 4. 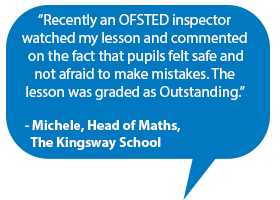 See for yourself how Realistic Maths Education can make a difference to many teachers and students. Take a look at this guide written by authors Sue Hough and Paul Dickinson. Download the Teacher's Book introduction.